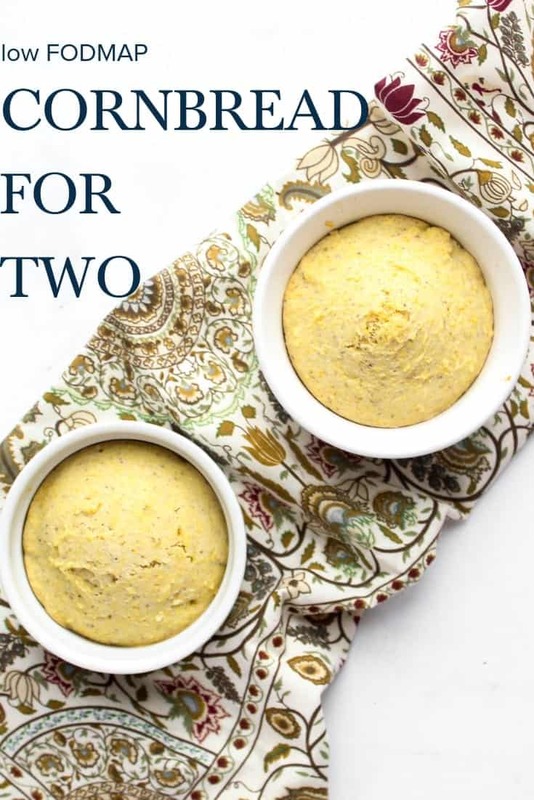 Low FODMAP Cornbread for Two is moist, flavorful, and the perfect side to go with a warm and comforting soup, stew or chili. Easy options to make this gluten free and dairy free! 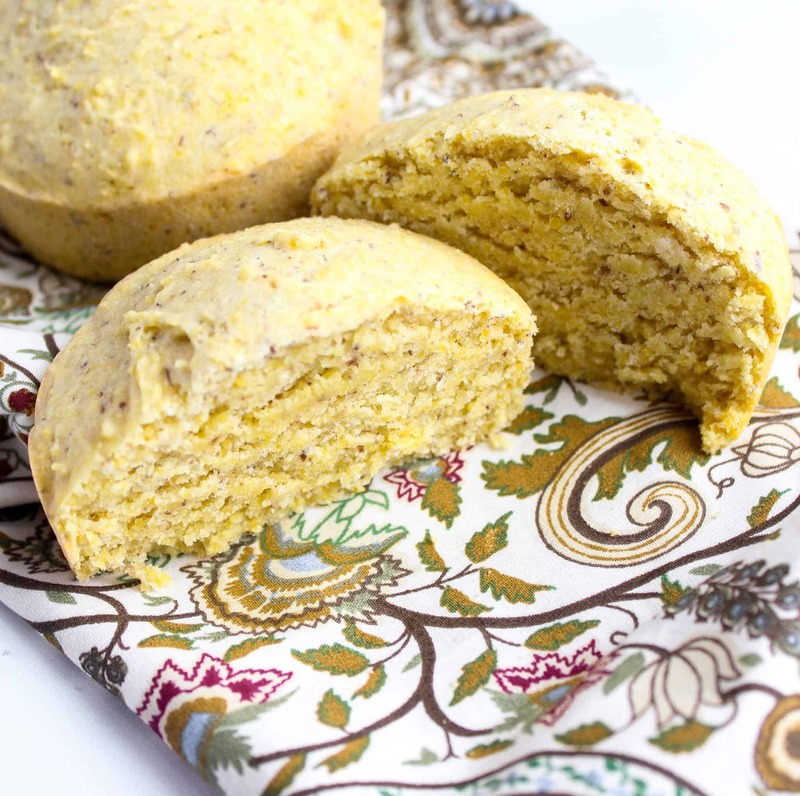 Pin low FODMAP Cornbread for Two here! 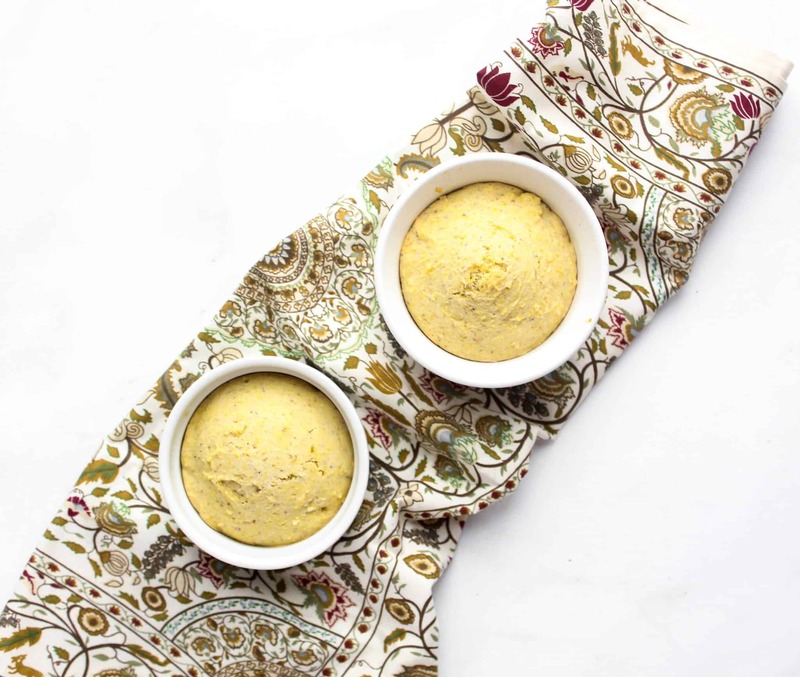 Low FODMAP Cornbread for Two is a family FAV! Growing up, I was a total cornbread lover…and guess what? I still am! So, because I LOVE cornbread (and Brian doesn’t mind it either!) I kept finding myself experimenting and making batches that were just TOO much. I mean I love cornbread, but I love like one piece at a time. Do you know what I mean? When I found Minimalist Baker’s Vegan Cornbread for Two, I knew I struck gold! 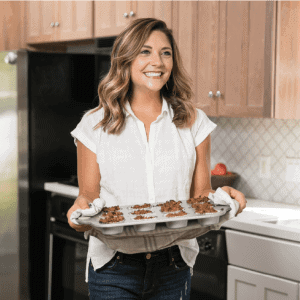 I have made that recipe over and over again, and like with many other recipes…I’ve tweaked it and made it my own along the way. Over the holidays, I received a package with free samples of Lo Fo Pantry’s All Purpose Flour, Baking Mix, Bread Flour, and Bread Flour with Seeds. I knew this would be PERFECT in my low FODMAP Cornbread for Two. I chose to use the Lo Fo Pantry All Purpose Flour to make this low FODMAP, but I have made it with a 1:1 gluten free all purpose flour, traditional all purpose flour and white whole wheat flour…and it turns out every time! 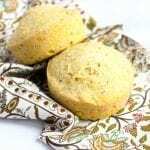 This cornbread is like a giant corn muffin that is moist on the inside, a little sweet, and has a nice balance of the corn to flour ratio. I use a flax egg and vegan buttermilk (almond milk with lemon juice) similar to Minimalist Baker’s original version. To obtain the moisture, I use a lactose free butter (like Green Valley Creamery) and lactose free yogurt. I haven’t tried this with a completely dairy free yogurt, so if you give it a try please let me know what yogurt you use and how the result turns out! I also have not tested this cornbread with a regular egg (in place of the flax egg) because the serving size is so small, I feel like one egg may be too much. If you give it a try with a regular egg, keep me posted on that too! I prefer to use a whole grain cornmeal like Arrowhead Mills. A non-whole grain cornmeal would work fine, but I always try to get the most nutrient-rich options possible AND you can’t taste the difference between degerminated cornmeal and whole grain cornmeal (in my opinion). When it comes to baking the cornbread for two, you can use two muffin tins, ramekins or any small oven-safe baking dish that you have on hand. This recipe has not been tested for FODMAP content, but ingredients are used in low FODMAP amounts according to the Monash University app. To make this recipe gluten free, use a gluten free 1:1 all purpose flour. To make this recipe dairy free, use a dairy free butter and dairy free yogurt. This recipe does contain nuts due to the use of almond milk. I really hope you love this recipe! It’s seriously a winner in my house! 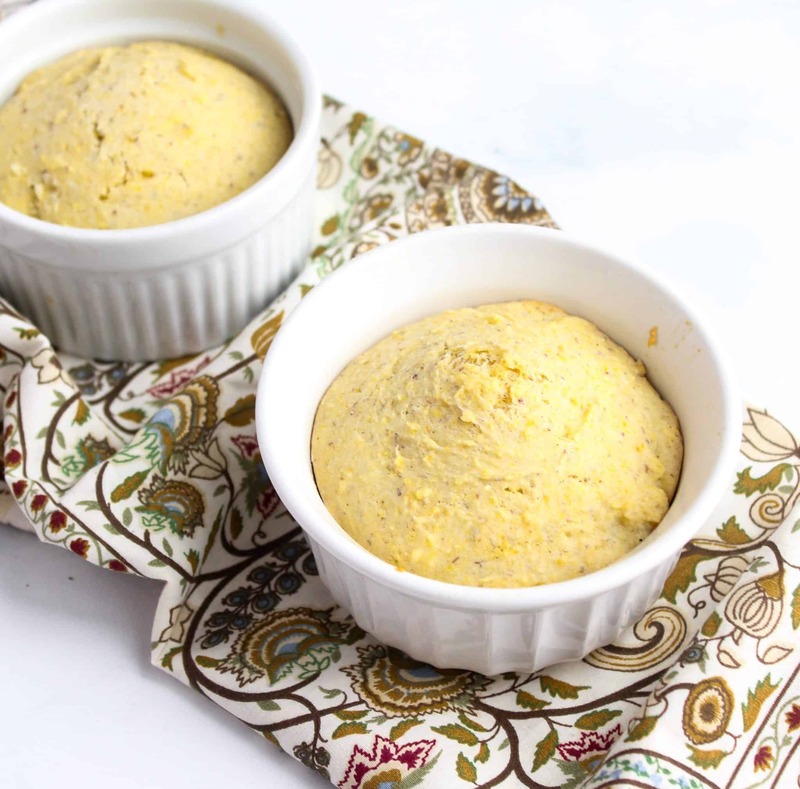 Low FODMAP Cornbread for Two is moist, flavorful, and the perfect side to go with a warm and comforting soup, stew or chili. Preheat the oven to 350 degrees Fahrenheit. Spritz two ramekins, small muffin tins or small oven-safe dishes with your favorite non-stick cooking spray. Make the flax egg by combining the water and flax in a small bowl. Allow it to set and become a more gel-like mixture as you get the other ingredients ready. Combine the lemon juice and almond milk in another small bowl and allow to turn into “buttermilk.” Once the milk is curdled, add the baking soda and stir. In a small mixing bowl, combine the sugar and the melted butter. Stir to combine. Next, add the flax egg and thoroughly combine. Then, add the buttermilk mixture and the yogurt or applesauce and mix completely. Add the dash of salt, cornmeal, and flour of choice. Stir until just combined, the batter will still be a little lumpy. Divide the batter into the prepared baking dishes. Bake at 350 degrees Fahrenheit for 25-30 minutes and enjoy! 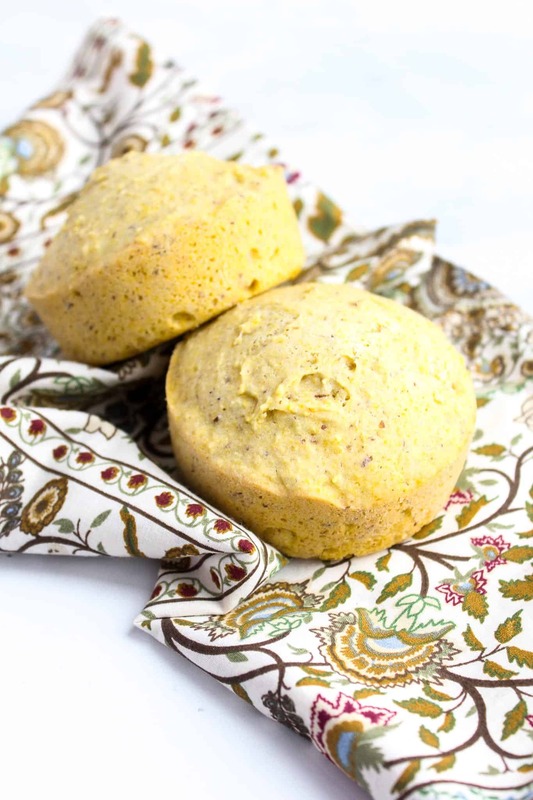 We love pairing this cornbread with our Slow Cooker Green Chile. *can sub dairy free or traditional butter here. **can sub applesauce instead of yogurt here. ***gluten free all purpose flour, traditional all purpose flour and white whole wheat flour all work well here. Adapted from Minimalist Baker’s Vegan Cornbread for Two. The ingredients used in this recipe are in compliance with the Monash University app. This recipe has not been tested for FODMAP content. What is your favorite way to enjoy cornbread? My hubs loooves cornbread! I may try this out with dairy free butter and yogurt! This is a good one!! It definitely works with dairy free butter and yogurt (or applesauce!) just that little bit makes it super moist!